What a fantastic day! I am not all that fond of giving speeches, even if they are getting a bit easier. 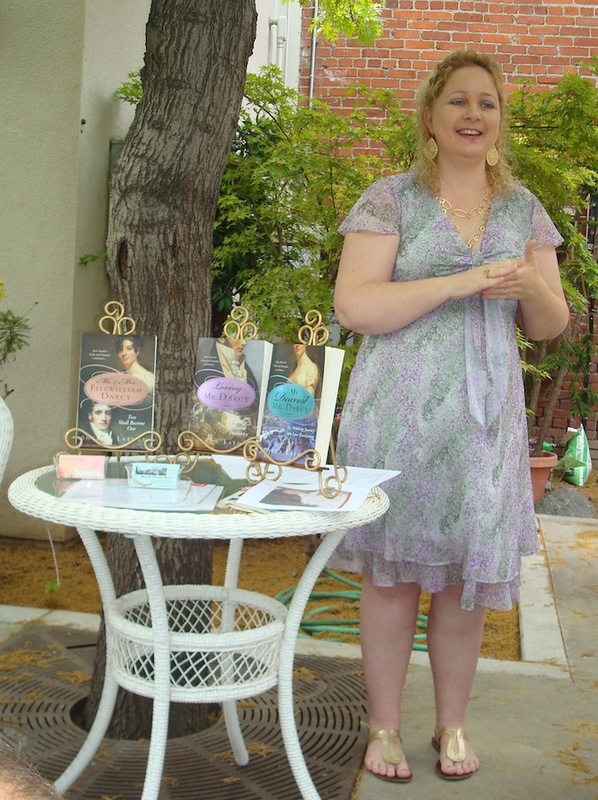 Nevertheless, it was a tremendous honor to be invited to speak to a group of Jane Austen lovers. A short background: Last fall I was contacted by Carrie Flores, the director of the Central California chapter of the Jane Austen Society of Northern America (JASNA). We struck up an instant friendship and I have been thrilled to discover a local group dedicated to the ongoing celebration of Jane Austen and the Regency. When Carrie asked me to speak to the group this April, sharing my passion for Jane as proclaimed in my writing, there was no chance of me saying no, even if public speaking is still terrifying! I am happy to report that the speech went very well with minimal shakes and shivers, and everyone was most welcoming and enthusiastic. The event was held at Hollyhocks, a lovely English-style shop with gorgeous knick-knacks and imported treats. The shop is amazing, and yes I did go on a spending spree! Additionally, Hollyhocks has a rear courtyard with brick patio and huge trees just perfect for an English tea. The food was wonderful, the scones to die for, and flavored teas never-ending. About 30 people came to partake of the culinary delights, springtime atmosphere, and to hear me talk about how Jane Austen’s timeless tale has inspired me. In fact, “Inspiration” was the theme – one that is VERY easy for me to talk about since this entire journey of mine was birthed by overwhelming inspiration. My husband and daughter accompanied for moral support and assistance. I met a wealth of terrific people who were incredibly kind. I was very nervous, not only about speaking but because Austen devotees can be harsh in their acceptance of fan-fiction writers (as I sadly know all too well). I am happy and humbled to report that every single person was gracious with not a single hint of dissatisfaction or negativity. Whew! I have to confess that it feels very good to be welcomed into this world and I really look forward to becoming more involved in the future. ← I am not a funny gal! We had a great time and the people were very nice. Carrying the two boxes of books two blocks was challenging and if not for Albert we wouldnt have made it. The parking was an issue because of a local festival. I bought a portable dolly today to lug up to 150 lbs. The patio area,light sunshine and gentle breezes complimented the food and company well indeed.Sharon’s delivery of her message on inspiration was simply excellent and reading passages from her books a treat. Emily and I really really enjoyed it,as did Sharon. I agree with all the ladies Sharon! To now say that a JASNA group has embraced you, is yet another milestone in this incredible journey. I’m so proud of you for your strength and determination dear friend! Looks like you had a lovely time at the spring tea. (your alternate seaons are still something that throw me hehe). You look so pretty and fresh and young! in your lovely pics!. Wishing you many many congratulations and continuing favour and success Sharon. It must have been a wonderful moment to share with your loving Hubby and precious daughter!. Congratulations on the warm reception you received from the JASNA group! How could they not love you? Your devotion and passion for the Darcys can not be denied. If they love JA, how could you not be accepted. You have carried a wonderful love story forward in the most positive ways with your books. I’m glad all went well for you and you had Steve and Emily for support. You have done amazing things in these past few years and should be very proud of yourself. We are all extremely proud of you and your accomplishments! Keep up the good work! Thanks ladies! You are very kind. I still think I should stick Emily up there and do a Cyrano de Bergerac (sp?) kind of thing! Think anyone would notice? LOL! It was very fun, I have to say, once I stopped shaking. The papers were rattling in my hand! But after a few minutes I calmed and got into my topic. What can I say? I am passionate about the Darcys and that love eventually overcomes the nerves. Still, I am glad I do not have anything speech-like coming up. Ha! Now I can enjoy the fun of being a part of this great group and other fun events like booksignings. Lots to come! Sharon thanks for the wonderful pictures and your books together look absolutely wonderful and you look amazing. I am glad you had such a great time and met new people and your husband and daughter were with you – How great is that! Sharon, I am so delighted for you. I must admit I felt a little twinge of anxiety when you said you were due to speak to JASNA, however I am delighted that you got such a warm response. And who couldn’t be warm towards you? Congratulations, your talent as a writer shines through! You are looking great by the way! My heartfelt congratulations to your success! It always feels good to be accepted. And now you have "conquered" another group of people. I am so happy for you that the very hard times you had about a year ago turned out in something so amazing. You are getting more and more an approved writer, who is known for great storytelling, historical facts and a real devotion to the world of Jane Austen! And you are looking fabulous! It seems that your hair is a little bit longer and is there a hint of lavender in your pretty gown?